There are certain times when a random food craving hits and lingers until I am satisfied. This time around, it was meatball subs. 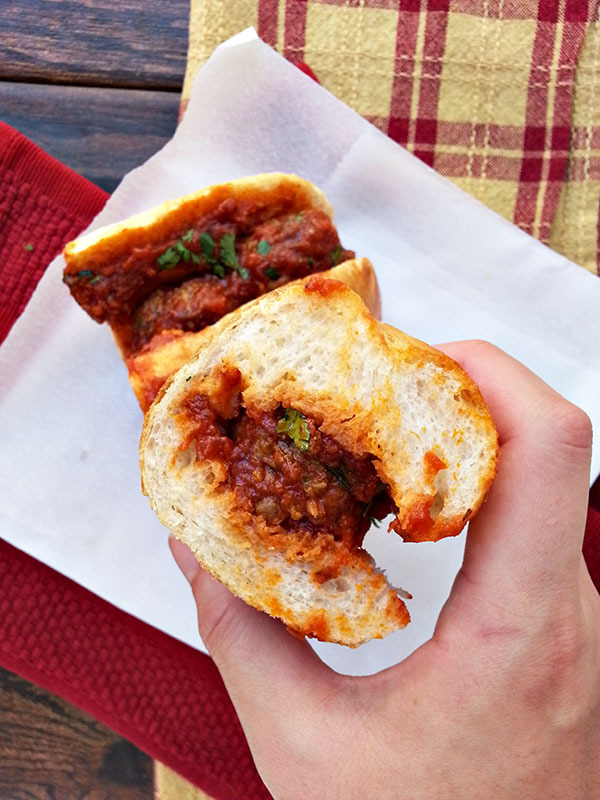 I haven’t found the perfect meatball sub yet but can safely say that I’ve had many that were still tasty. While thinking about the next time I would meet this sandwich, I thought to myself, “why not stuff the meatballs with cheese? !” It was such a simple idea but it might change the entire sandwich. 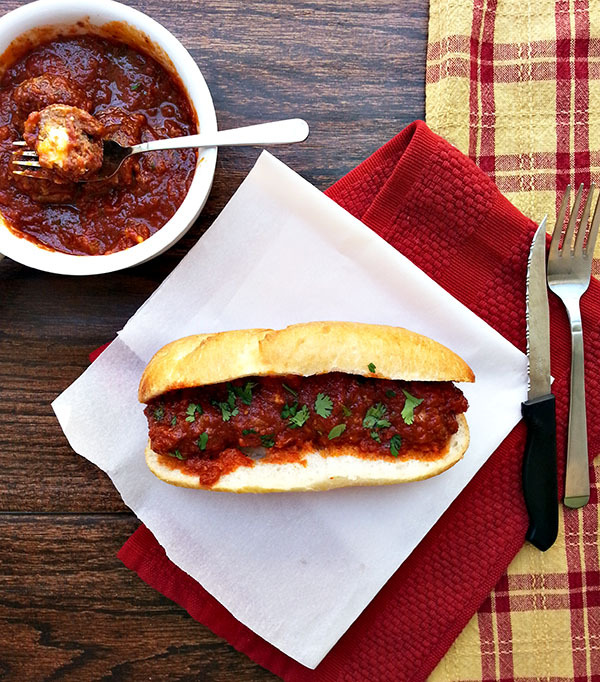 It was time to test out this idea – gouda stuffed meatball sub, here I come! Heat olive oil in a medium saute pan over medium-high heat. Add onions and saute until softened, about 5 minutes. Add garlic and cook 30 more seconds. Remove from heat and cool. Mix together ground beef - water with onion mixture. Season with salt and pepper. 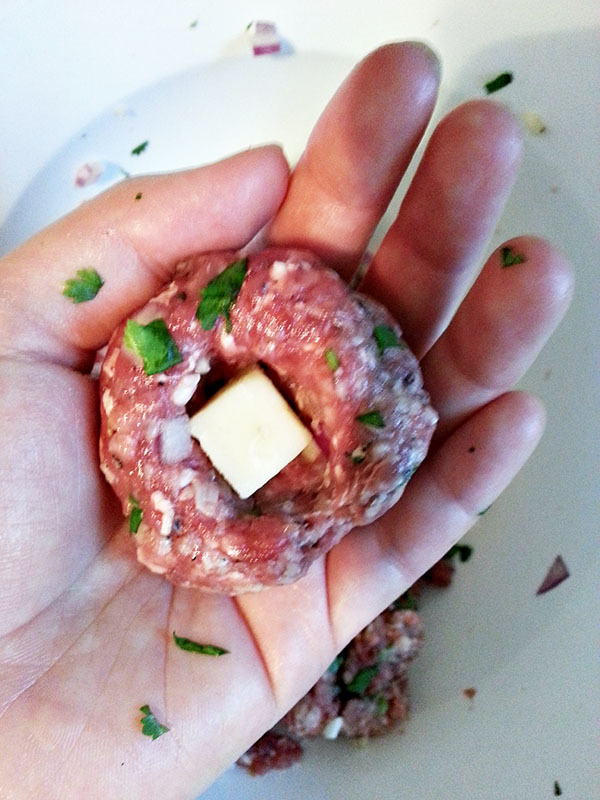 Use your hands to form a 1 1/2 inch meatball. Make an indentation in the center and place 1 block of cheese. Cover the cheese with the meat. Repeat with the remaining meat, making about 12-15 meatballs. Heat 2 tbsp olive oil in a deep skillet over medium heat. Add the meatballs, making sure not to overcrowd the pan. You may have to cook the meatballs in batches. Brown the meatballs on all sides, turning as they cook. Remove from pan and set aside. Discard the oil. Heat 1 tbsp olive oil in the same pan. Add the chopped onions and saute until softened, about 5 minutes. Add the garlic and cook an additional minute. Pour in the red wine and increase heat to high. Reduce the wine until almost completely evaporated. Add the canned tomatoes, and season with salt and pepper. Bring to a boil. Reduce heat to low and let simmer 20 minutes. Add the meatballs and cook 20 minutes or until completely cooked through. Place 3-4 meatballs per sub and spoon extra sauce on top. Serve. 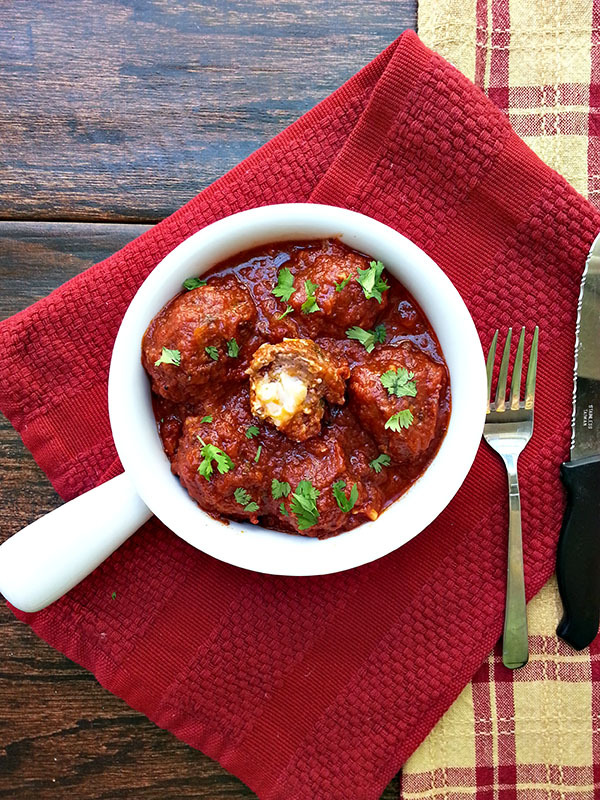 Although the meatball base for this recipe is a basic recipe, the cheese changes the entire meatball. For the meatball, I like to mix a combination of meats to make the meatball more tender. I go with pork and beef but feel free to add veal as well to make the meatball even more tender and juicy. I prefer to use fresh breadcrumbs whenever I prepare meatballs. Cut the crust off of the white bread slices and toast. Process until finely chopped. Add to the meatball mixture. Gouda is one of my favorite cheeses and is one of the most popular. A semi-soft cheese with a nutty, slightly sweet taste with a creamy texture, this cheese pairs easily with many flavors. I have yet to try aged gouda but have written it down on my to-do list! Prepare the meatballs and shape. Make a well in the center, place the block of cheese and cover with the meat. 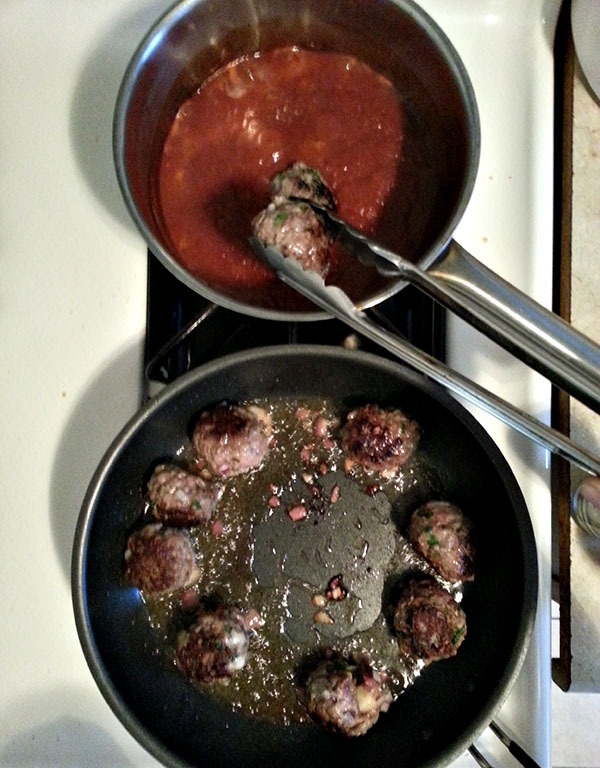 Sear the meatballs to get a nice caramelized crust and finish cooking the meatballs in the marinara sauce. Twenty minutes later and you have gouda stuffed meatballs! Enjoy as is, over a bed of pasta or as a meatball sub. Oh wow, my mouth's watering! Comfort food made best with extra cheese!